Certified up to 800 lbs. Each chair weighs less than 7 lbs. Measurements: 18.25 x 11.5 x 39.25 in. 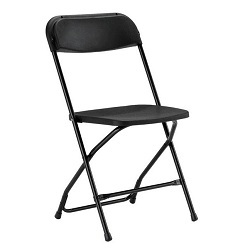 * Please call us for any questions on our chair black folding rentals in Shreveport and Bossier City, Louisiana.